February's (and march's since I purchased the 16.9 fl oz bottle) body wash is L'Occitane's Almond Shower Oil. 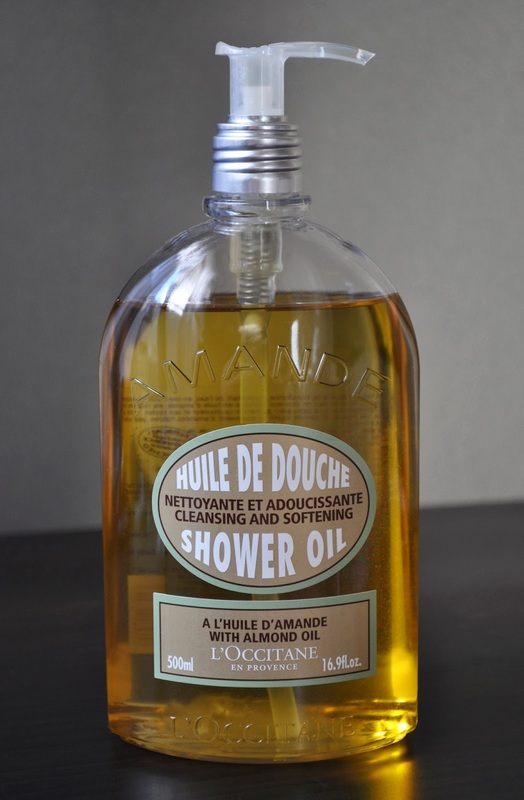 I've been using the almond shower oil (as well as all the other products from the almond line) for many, many, many years, and it's my favorite scent amongst all of L'Occitane's collections. Almond Shower Oil is a mixture of sweet almonds and marzipan (If that makes sense, given that marzipan is generally an almond paste. However, there is a difference between the two, and I've rambled for too long, but I hope you understand). So many great memories are tied into this heavenly fragrance. The scent always makes me feel nostalgic and I find myself staying in the shower longer than needed. When the almond shower oil comes into contact with water, it emulsifies into a luxurious milky lather; leaving my tight, dry, itchy Winter skin feeling nourished, soothed, amazingly soft and yummy. Have you tired any products from the Almond Collection? I love this oil, and lots from the Almond line, but L'occitane is too rich for my blood most of the time! If I'm lucky to score it on sale, I really love this and the body cream. I adore this too, this winter I've been using it and their shea butter creams like crazy! I also pair it with the Almond Body oil, it leaves skin so soft and the scent is intoxicating. I love the Almond Body Oil! I keep a bottle in my bag at all time. I can smell this scent for ages. Love me some Marzipan! I like Dr.Bronner's Almond soap, and they carry the brand here, but not the Almond scent...negative points for Japan :P Now I have to get my hands on a bottle and try it on my brushes. Hmmm...interesting. I have never tried any almond collection that is why it is kinda intriguing to me. I will check on this and see how it works.